Since 1983, we have worked to develop Transit System Plans that guide our thinking and our planning to create transit projects that best move our region forward. Developing the 2040 System Plan is a collaborative and iterative process that includes forward thinking plans for bus service, rail service, corridor plans, and other larger system projects that all fall within DART’s 20 Year Financial Plan. Creating the 2040 System Plan is an iterative process that is completed in phases. Phase 1 consists of creating a Comprehensive Operations Analysis (COA). Like a yearly physical, the COA is a checkup for the DART system. It looks at DART overall and identifies areas of improvement and potential obstacles the system is working to overcome. Phase 2 will identify potential long-range capital projects, regional opportunities, new policy and program areas, along with the final version of the entire 2040 Transit System Plan. Taking into consideration this feedback, DART then completed a draft Bus Service Plan and has already begun to implement some of the suggestions. Highlights of this plan include an increased focus on frequency and crosstown routing enhancements that are set to take place in the near future. A couple of potential pilot programs are set to kick-off soon and include, on-call and mobility on demand, regional airport express route, and transit center innovations. 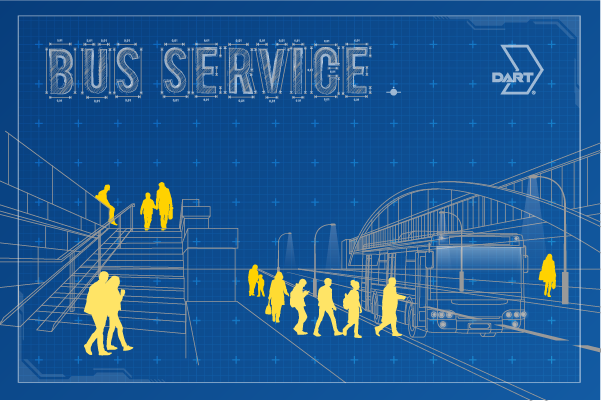 DART is always thinking about North Texas’s transportation needs now and in the future, therefore the Bus Service Plan is a living process. That means that DART is consistently evaluating and changing bus routes, frequency and service to best meet the needs of our region. The 2040 plan and the Bus Service Plan allow DART to outline a path of mobility that moves our region forward. This entry was posted in Capital Projects. Bookmark the permalink.